Is Microsoft Band the Device AppleWatch Should Fear? Microsoft has had a huge couple of weeks. The updates have been broad, impacting a whole lineup of products and solutions from the company. One of those announcements was Microsoft Band, the lifestyle and fitness wearable that has a huge number of sensors and Cortana. The device went on sale yesterday and it has pretty much sold out of your local Microsoft store and for sure online. The Microsoft Band, while innovative in design, fundamentally isn’t bringing anything terribly new to the wearable market, especially the fitness market. Fitbit has somewhat been the standard when it comes to fitness wearables but Jawbone’s Up has also been there as has Nike’s Fuel Band. But really, when you do a stare-and-compare, you think Fitbit. When it comes to Smartwatches however, the game is pretty much wide open. Apple is introduced the AppleWatch two months ago and it was immediately compared to the Fitbit line up and every Smartwatch that any Android based manufacture had ever produced. What you get past the distortion field however and really look at the AppleWatch, it has some serious flaws. Like deal breaker flaws. I’m going to look at three of them: Cross-platform support, price of entry and ease-of use. What I’m not going to do is compare the Microsoft Band to anything from Fitbit. Frankly, there are a lot of people who only want a step tracker or calorie tracker. They produce some fantastic solutions that, while certainly more limited when compared to the Band, do a great job. I’m on my 2nd Fitbit in 5 years (they take a beating and keep on keeping on) and it is the only wearable I’ve ever used or considered until the Band was released a couple of days ago. I think the only way you can do a proper comparison of a Fitbit product to the Band is if you compare the upcoming Surge. But if you need integration to your Windows Phone and other apps, I think the Microsoft Band will be better. 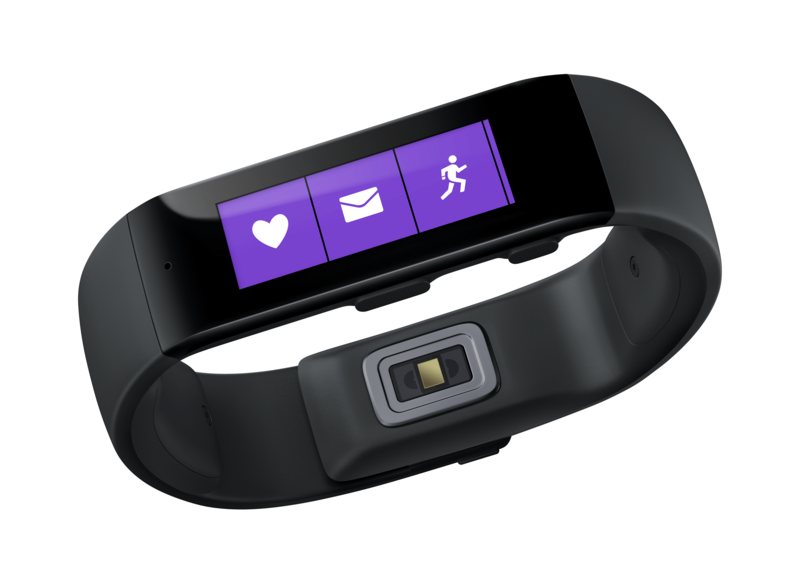 Microsoft Band is supported on Windows, Windows Phone, Android and Mac. Try that with an AppleWatch. It goes beyond the device though with the app Microsoft Health. Yes you can have iTunes on a PC and yes you can sync an Applewatch (I’m assuming) to that but to get the fully integrated experience you have to be running an Apple product. That limits the potential market reach of this device in a market that is going to be difficult to penetrate anyway. Microsoft’s willingness to step across walled gardens with Microsoft Health and be open to everyone has some huge benefits. First, you aren’t locked into any particular platform. I love Windows Phone and I’m happy to be carrying around this platform in my day-to-day life now. But I’m realistic. I know that there are plenty of people where Windows Phone just doesn’t do what they want it to do. I’m fine with that. Microsoft, it seems, is fine with it too. Sure it’d be awesome if everyone was running around with a Lumia and I’m sure Microsoft would support such behavior. But they know that there are literally tens of millions of iPhones in the world. You don’t turn that over in one shot particularly when that shot is a not-really-necessary-for-life wearable. Second, you have feature parity across these platforms. As much as I personally would love to see some super special Windows Phone only feature on the Microsoft Band and in the Microsoft Health app, the fact that it is identical in function and feature across all platforms benefits every consumer out there. You can keep using the devices you like, love and know but add the Band and app to your everyday experience and get the benefits of them. That’s thinking ahead. That’s thinking like the new Microsoft. If you are fine with the walled gardens of Apple and Google on their wearables then the cost to enter into the game should make you pay attention. The Fitbit Surge and Moto 360 devices each are $249.99, $50 more than the Microsoft Band at $199.95. Okay, fifty bucks isn’t a huge delta. That’s a week of not stopping a Starbucks in the morning. You can manage that. AppleWatch? $349.95. And that’s the start. The upper end of the lineup could see prices come in at over $1000. That my friends is a price delta. The challenge with the entire wearables market is that none of these devices, really, are needed. I wear a Fitbit but the reality is my life would be just as complete if I didn’t have it. That is the challenge facing everyone in this space as everyone – Apple, Microsoft, Google and Fitbit – have to compel you to need this device. In my view, the $200 barrier is somewhat of the magic number. If you can be under it, your chances of success are greater. That is where I think Fitbit will be challenged with the Surge. That’s where Motorola is challenged with the Moto 360. Microsoft has positioned right at that barrier and will get some consideration simply because of it. Will they sell more? Let’s talk in a quarter and see where the financials break out. The bottom line though is that you could almost buy two of the Microsoft Band devices before you get to the cost of an entry level AppleWatch. Remember that $50 in Starbucks you are going to save? Put it towards a second Microsoft Band and have a spare. My last point when you compare the Microsoft Band and the AppleWatch is the ease of use element. When the AppleWatch was announced, I made two quick judgments about the UI. First, it’s busy. Like really busy. There are dots of apps everywhere and you can use the crown and touchscreen to change apps and interact with them. I do not doubt that once I actually play with an AppleWatch I will gain an appreciation for the design. Maybe. I’m open minded about it. But my initial thoughts were that is simply too complicated. Second, is the multiple ways in which you can or have to interact with the AppleWatch. There are taps, long taps, the digital crown and tap-and-holds. Compare that to the Microsoft Band. There is taps and talking (with Cortana). The UI is simple and direct. There isn’t much guessing as to what is going on or what you need to be doing at that particular point with the device. It’s uncomplicated. It’s simple but powerful. I’m not suggesting for a minute that the Microsoft Band will kill Apple’s AppleWatch. What I am suggesting is that Microsoft has positioned themselves far better in the market to be success than Apple has with their device. Microsoft’s openness with other platforms other than their own gives them an advantage, particularly for those who aren’t in the Apple ecosystem. Second, Microsoft has positioned the Band at a price point that just makes more sense. No it isn’t as elegant as the AppleWatch but if you are going to spend $1000 on a watch, will it be a piece of technology that has a far shorter lifespan than that of a traditional watch? Microsoft aimed the Band at a broad audience with a simple but powerful device that doesn’t bring out the full-on Geek look. Finally is the ease of use of the Band versus the AppleWatch. I’m still not convinced that the UI of the AppleWatch is the best approach but I’ll remain open minded until I see and touch it. But purely on a first gut feel, it looks far more complicated. With the Band, I’m confident I could pick it up and know what to do with it within minutes. That’s what the market needs and what people want. This is why Fitbit has been so successful. Microsoft is poised to do something special with the Microsoft Band. They have to execute for sure and they have to continue to develop the product. But with a sell out already on their hands after just a day, Apple should be paying attention.